These easy Garlic Herb Mushrooms are so flavorful and come together in just minutes! I love these as a side dish, but they’re also fantastic as a topping for steak, pasta or chicken, or even as a snack. Once I start eating these I never want to stop! The sautéed mushrooms are soft, but the edges get golden and crispy in the butter. The salt, pepper, garlic and herbs may be simple, but they give these mushrooms an incredible flavor. You can whip up these Garlic Herb Mushrooms in less than 10 minutes, so they’re perfect as a quick weeknight side dish or to top some meat off the grill. You can also easily halve the recipe to make a smaller quantity if you’re only serving one or two. Better still, a serving of these savory, buttery Garlic Herb Mushrooms is just 52 calories or 1 WW Freestyle SmartPoint. Just one SP! 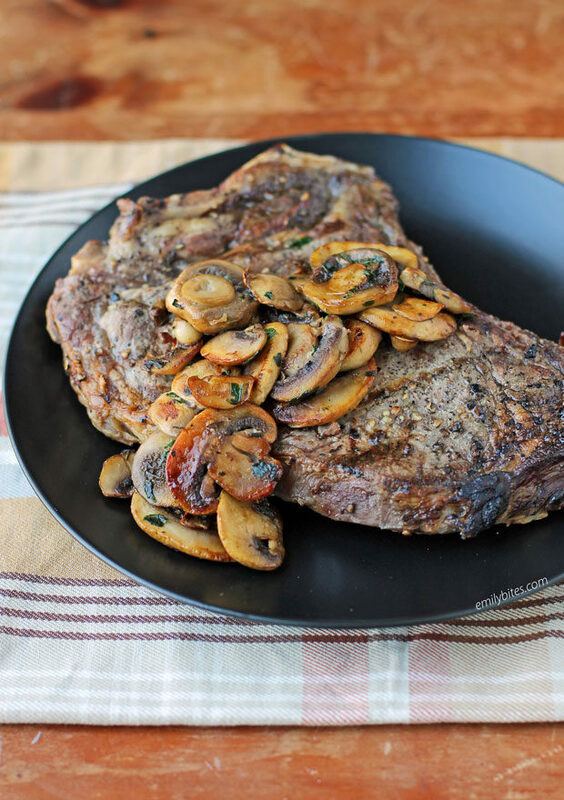 These Garlic Herb Mushrooms make a great topping for steak or chicken! 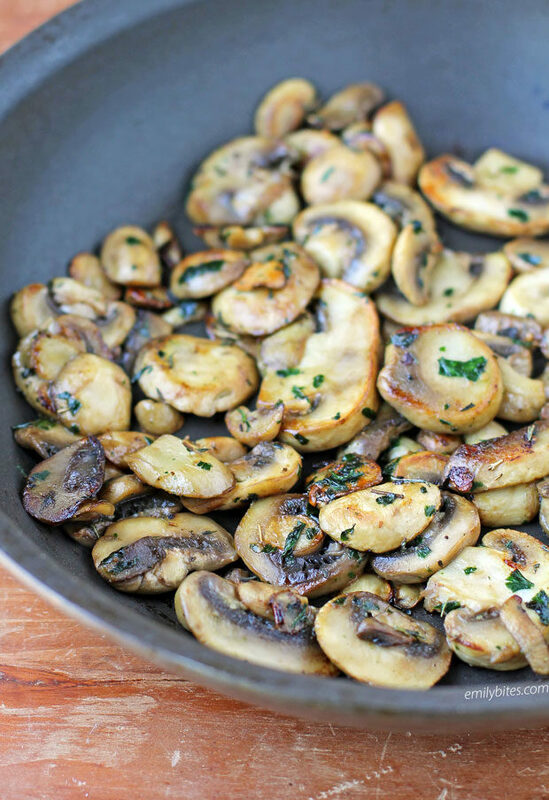 Looking for more tasty lightened up side dishes like these Garlic Herb Mushrooms? Try my Garlic Roasted Green Beans with Almonds, Salt and Vinegar Roasted Cauliflower, Easy Salsa Rice, Roasted Fingerling Potatoes, Roasted Delicata Squash, Hummus Veggie Tots, Loaded Cauliflower Bake, Parmesan Roasted Sweet Potatoes, Spinach and Parmesan Orzo, Cheesy Broccoli Bake, Garlic Thyme Roasted Carrots, Easy Garlic Knots, Butternut Squash Quinoa Salad, Roasted Smashed Garlic Potatoes, Sweet Potato Casserole Stacks, Cheddar Bay Pull Apart Muffins, Cheddar Broccoli Orzo, Broccoli Salad, Tomato Cobbler and many more in the Side Dishes category of my recipe index! Bring the butter over medium-high heat in a large skillet until melted. Add the sliced mushrooms and cook, stirring occasionally, for 5-6 minutes until the mushrooms are softened and golden around the edges. Sprinkle with salt and pepper to taste and add the parsley, thyme, and garlic. Stir together and allow to cook for another 30-60 seconds until the garlic is fragrant. Remove from heat and serve. So funny! I madenthesenthe other night for just me since nobody else in my family eats mushrooms. I ate all of them before the rest of dinner was ready!